Flat irons are the devil! A couple of years ago I decided part of the reason my hair was so frizzy is that it was damaged from all the shampooing , blow drying and flat ironing I was inflicting on it every day. I decided to be kinder to my hair and part of that included shampooing only every other day and giving up the flat iron (those things are the devil). At first I just went cold turkey and hoped for the best. If it was a good hair day then so be it. If it was bad hair day – well, then I obsessed about it all day. Then I read about dry shampoos helping with “2nd day hair” and decided to try them out. A quick word about how dry shampoos work. Dry shampoos come in a spray format like hairspray. The best technique I found is to first spray the roots on top and then lift your hair section by section and spray where you need it. Hold the can at least 6 inches away while spraying – this will make a difference! When done spraying move on with your beauty routine – brush your teeth, wash you face, pluck your chin hairs, whatever you need to do while the spray absorbs the excess oil. 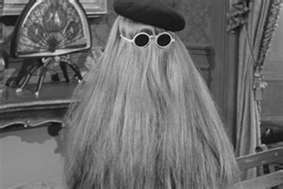 After a couple of minutes give your hair a light brush. Congratulations, you are done! 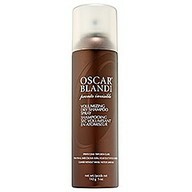 The Oscar Blandi was my first dry shampoo. This is one of the pricier dry shampoo options out there but I got mine on sale for $15. Being a dry shampoo virgin I wasn’t sure what to expect. I loved the lemon smell, thought it made my hair look cleaner and less like I just rolled out of bed. However I did not see much volumizing action going on. My hair retained a lot of it’s shine and did not seem weighed down by the spray. This product gets big bonus points for being a clear spray. 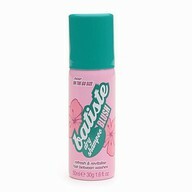 Next I tried Batiste’s Dry Shampoo ($7.99 at Ulta) which is a powder based product. This did add volume, lots of it actually. But the smell was too intense and my blond hair looked gray, presumably from all the powder. My hair also looked really, really dull. Over time I began to spray from 6 inches away or more and that helped with overpowdering my hair. Still, I could not get over the strong smell and quickly stopped using it. This was probably the best all around dry shampoo – inexpensive, volumizing and good at removing oil while not leaving a dull residue. The smell was a little overpowering in a sweet and flowery way at first but the intensity dissipated quickly. This smelled terrible, broke me out in hives and left my hair looking matted and even oilier. Oh my god! There is good, there is bad and then there is truly wretched. Please learn from my mistakes! Please note that Keratin is the last ingredient listed on the label so I am not sure how much Keratin benefit you are going to see with the product. However, this is a pretty good dry shampoo, offers volume, and is inexpensive. The best thing I discovered on this quest was dry spray conditioner. What? 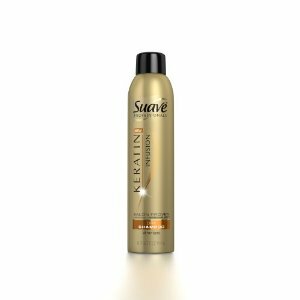 While looking for dry shampoos to try I stumbled on Suave’s Dry Spray Conditioner ($3.99 CVS). Finding this conditioner was a total find! It has a microfine spray and a very, very light texture. This is perfect for spraying on the ends of your hair when it needs a little extra shine but you don’t want to weigh your hair down. Now that I know this type of product exists I will be on the lookout for more brands to try! At the end of the day I liked the Oscar Blandi’s spray the best. 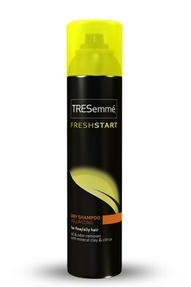 I thought the scent was nice and liked that my hair retained more shine and had less build up than the other products. My second favorite was the Salon Grafix brand which was a whole lot less expensive. The result – myy hair is much healthier and less frizzy since I have started shampooing every other day and I get to sleep a little longer on the days that I skip washing my hair! Bonus! Any dry shampoo experiences? Leave your comments below.